This extraordinary box of twelve colossal sized truffles is the result of countless hours spent sampling our artisan chocolatier's best creations. It wasn't easy, but we refined our assortment to these six tantalizing flavors which include: Black & White, Milk Chocolate Raspberry, Dark Chocolate, Peanut Butter Sea Salt, Milk Caramel, and Milk Chocolate. These ultra creamy truffles are impressive in taste as well as size and will be a real wow for your favorite chocolate lover. 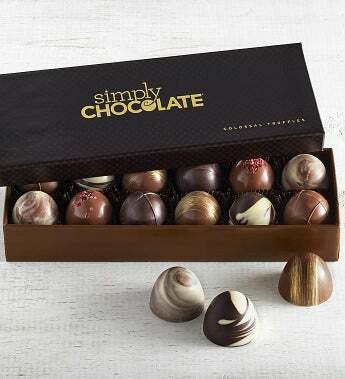 A Simply Chocolate exclusive! This extraordinary box of twelve colossal sized truffles is the result of countless hours spent sampling our artisan chocolatier's best creations. It wasn't easy, but we refined our assortment to these six tantalizing flavors which include: Black & White, Milk Chocolate Raspberry, Dark Chocolate, Peanut Butter Sea Salt, Milk Caramel, and Milk Chocolate.